As a car owner in Cicero, Berwyn or Chicago, you know how important proper wheel alignment is to your tires and to the continued use of your car. If your wheels aren't properly aligned, your steering wheel will pull to either the right or the left, instead of staying on a steady and straight line down the highway. At Trans-O-Mex, we know as well as you do wheels that aren't aligned properly will put unnatural wear and tear on your tires and the pulling when you drive could end in an accident. Unbalanced wheels can also cause poor gas mileage. The easiest way to perform a wheel alignment on your car is by using computerized alignment equipment to get the job done the right way the first time. This equipment is used to check the angles on all of the wheels on your car. We will check for adjustable and non-adjustable angles when you bring the car into our shop. We can then decide if we need to repair or replace your suspension component if there are non-adjustable angles. 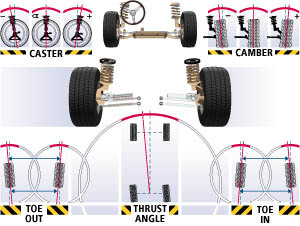 When it comes to wheel alignment, there are four common adjustable angles. These are the toe, which is the direction in which the wheels tilt; the camber, which is the way the wheels tilt away from one another; the caster, which is the angle of your steering axis; and the thrust angle, which has to do with the way all four wheels are aligned with each other. Contact us today for more information on wheel alignment in Chicago, Berwyn and Cicero.